Add seating to your space with these 18" bar stools! These Amish wood swivel bar stools are the perfect complement to the rest of your oak bar furniture. Show off your rustic flair with the long twigs supporting this handcrafted Early American bar stool. Invite your guests to have a seat on this rustic twig Bar Stool with a contrasting solid wood seat. Furnish your kitchen or bar with the rustic hospitality of this durable handcrafted Bar Stool made with unique twigs. 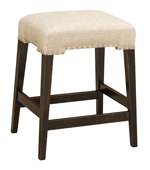 Create rustic elegance in your bar or cottage kitchen by adding this twig Bar Stool with its plush, round seat. Your Bar Stool can provide your rustic kitchen with a solid seat when you choose this pine top stool. This twig bar stool has a swivel base to add fun to your rustic atmosphere. Tall twigs adorn any kitchen or bar when you furnish your home with this rustic and unique barstool. Enjoy your rustic Bar Stool in comfort on this broad upholstered seat over hand-constructed twig legs. Bring out the rustic style of your home with the long twigs of this Bar Stool. Who says country style can't have a glamorous edge? This twig Bar Stool's bent legs and rounded seat will grab attention in a kitchen or bar. This Bar Stool is tall and rustic, but you know it is handcrafted of solid wood for any guest to enjoy. This tall bar stool has an upholstered seat and a back for taking it easy in a rustic cabin. Pictured in brown maple with CF 7992 Asbury stain. Seat shown in Linen fabric. Pictured in brown maple with Onyx stain and 29-23 Rink Fabric with Nickel Tacks. Seat - 14" x 18"
Base - 16¼" x 20"
The barrel Bar Stool is a classic choice for any bar in your home—whether it’s your breakfast bar, in your den or in your basement. The solid wood construction and first-class leather seat are durable and dependable like all of Amish furniture. The clean, simple style of these Bar Stools will never go out of style and will fit into any room. Height 18", 24" and 30"